NABA student chapters are on more than 150 campuses across the Country, offering the opportunity to be involved with the professional community, create a community of their own and build leadership skills. You can link yourself to your school’s NABA chapter when you join. Check out our NABA Student Chapters to see if your school has a chapter. If your University is not currently listed, you may consider working with a faculty member to start your own chapter. Click here to view even more reasons to join NABA as a student! Professional and student members may select to be affiliated with a chapter. If no chapter exists in their location or school, they can opt to be a member-at-large. While many of our programs and networking events are delivered by local chapters, all members may attend any NABA event regardless of chapter affiliation. Join a Nationwide network of aspiring Accounting, Finance and Business leaders! To prepare college students for a professional career through engagement, mentoring, personal development, exposure to the work place through internships, scholarships through our scholarship program and public speaking/presentation skills through case competitions. These initiatives also aim at identifying and nurturing exceptional leaders in higher institutions. To learn more about NABA Baltimore Metropolitan student programs, CLICK HERE. As much as a person has friends on campus it is great to have a group of peers in the same major or related field as you. You share experiences such as finding jobs, passing classes, taking school or professional exams, and developing friends and contacts that can help you get through the transition from college to professional life. 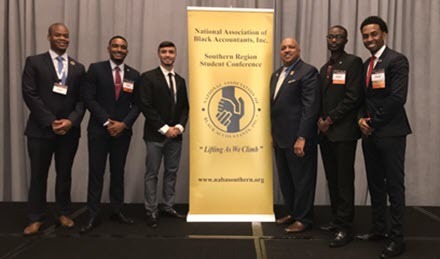 As a NABA student member you also have the opportunity to attend the annual NABA Regional Student Conferences where you will be able to network with your peers but also with professionals and leading companies in the accounting and finance fields. NABA’s professional/student network is large and diverse. There are over 150 student/professional chapters across the country. NABA membership creates an automatic bond between you and other members at your school, at other schools, and in other cities across the country. The bond extends to professional members across the country who consider you a member of the organization and are happy to work with you to build your future, whatever your personal or professional goals. NABA Baltimore Metropolitan chapter hosts a variety of events throughout the year and the culmination of NABA events is the annual NABA National Convention.